‘Chiare, fresche et dolci acque’ (Clear, fresh, sweet water) – opening line of a poem by Petrarch – surround a fountain. Clear, fresh, sweet cocktails (well, Chardonnay for me, but, hey, poetic license) were sipped in the garden of artist and garden designer Shirley Watts and her husband Emmanuel Coup in Alameda, California. And ’twas indeed fresh. Especially fresh ideas. 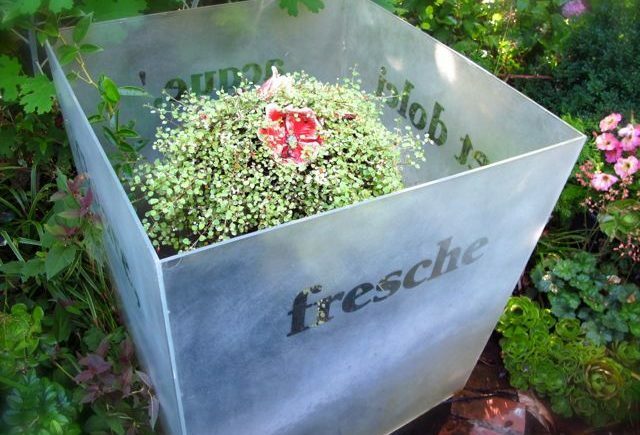 Of all the things I could write about – including Watts’ clever artwork from salvage and deft plantings – it is her use of words in the garden I’ll remember. The translucent box enclosing a fountain at the top of this post is one. 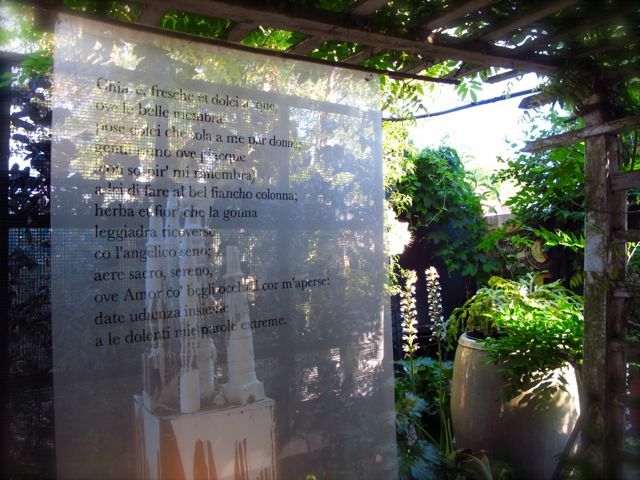 Etched on the panels are words from Poem 126 of Il Canzoniere (The Songbook) by Francesco Petrarch – the first stanza appears on a scrim curtain in the arbor below. Behind the poetry, a sculpture composed of salvaged lathed wood looks like a snow-draped Gothic castle. As soon as I saw an image of Watts’ patio below on a preview post (do click it) for the Fling*, I knew I would be stealing this idea. Yes, I’ve said it. Stealing. 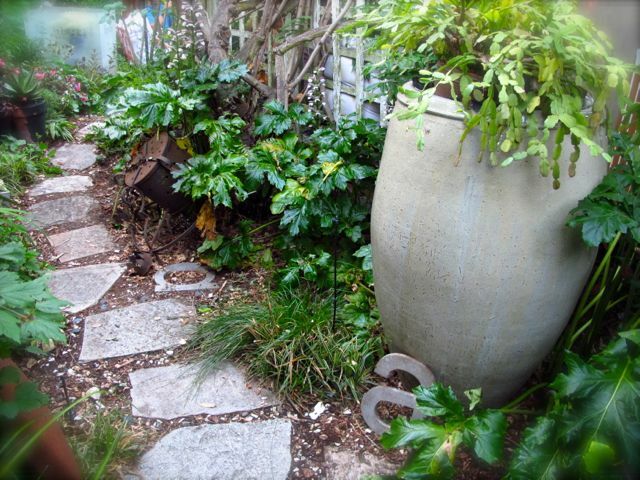 I have a patio just begging for letters between the stones. Plus, I have a few letters. Google “metal letters,” and I’ll bet you find sources near you. May we all be as adept at arranging them as Shirley Watts. 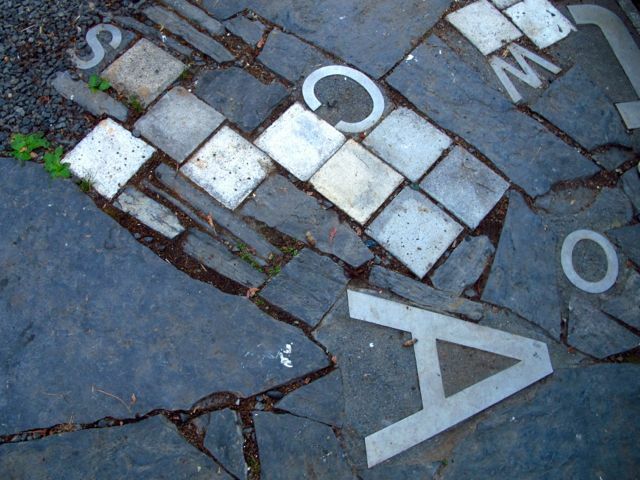 Love the marriage of straight and jagged in this carefully composed stone tapestry. Even a few scattered letters, as below, adds to the literate touch. I didn’t search for meaning – perhaps there is a hidden message, like the name of the architect E.J. Lennox hidden in the stonework at Toronto’s Old City Hall. Perpetuating the fiction that I am alone in the garden. Pay no attention to the 49 other garden bloggers behind the curtain. These themes were also explored by Watts in a group exhibition called Natural Discourse at the University of California Botanical Garden, which ended before our visit. Would love to have seen the transformation of the subway station. Take a minute to see it in the video at the bottom of that link. Another imaginative salvage with a literary bent – the carriage lights below, papered with extracts from Mary Shelley’s Frankenstein, emit a soft, yellow light after dark. Similar lights in the front garden feature strong but simple brush drawings of insects. 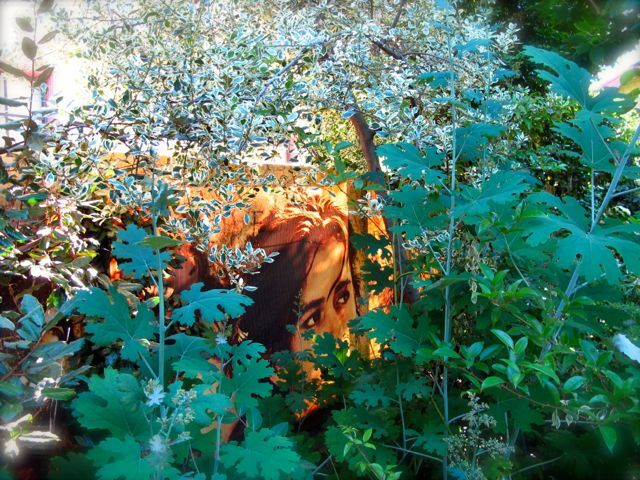 Watts uses translucency such is this to great effect, inside and outside her home. The fireplace in the living room, for example, is screened by a large sheet of white vellum, behind which pendant bunches of flowers cast soft, complex shadows. 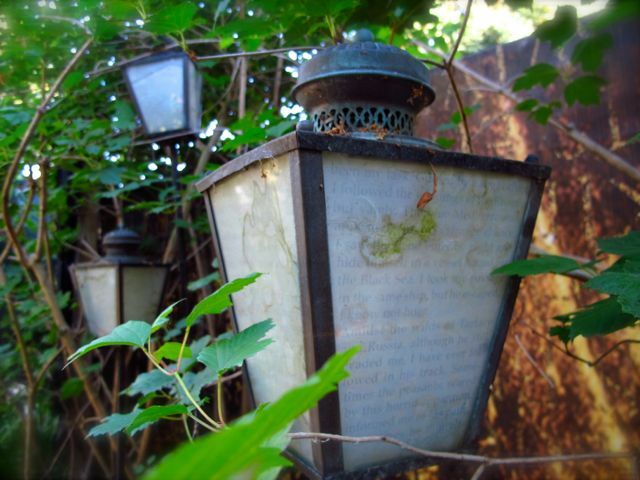 And, below, panels from a back-lit billboard for the movie Troy run along the garden as a fence. That’s Orlando Bloom giving the plume poppies the eye. Scarcely legible as text, the movie poster’s Roman-style lettering applied here is a great mash-up of pop and culture. *These images come from the Garden Bloggers Fling 2013 in San Francisco – an annual meet-up of garden bloggers now in its sixth year, and attracting bloggers from across North America and even the UK. Next year is Portland. But stay tuned for 2015, when we Fling in Toronto. Be there? You bet I'll be there! 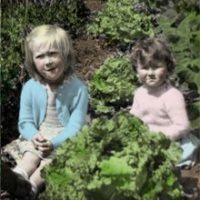 Great post on Shirley's garden, particularly translating the fountain text for us. 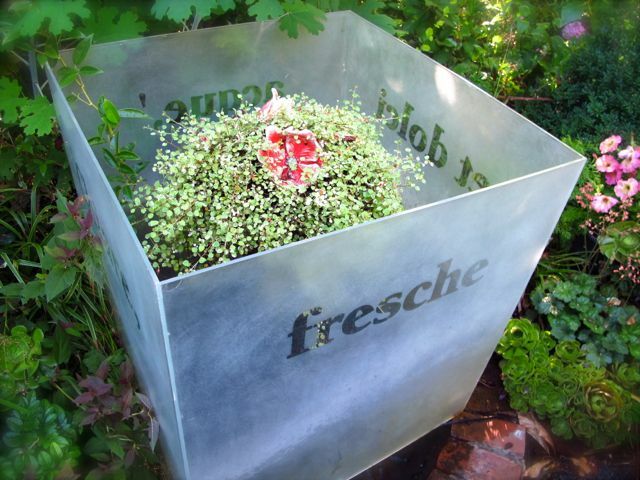 I had guessed that she'd used a repurposed cube, but since the text fits so beautifully with a water feature, now I believe she must have had it custom-made. No problemo, Pam. Google is our friend at times like this. I often find out more about a garden *after* I've visited than while on the Fling. Helen, I enjoy your blog and wish I had known about the Fling in San Francisco in time to attend. I will definitely plan to come to Toronto in 2015 and would be very interested in Portland. Where do I get more information? Each Fling is run by a local volunteer committee, which puts in a ton of volunteer time to organize the itinerary and keep it not for profit and affordable for attendees. Oops, I should also add that, if you are on Facebook, there is also a Facebook Garden Bloggers Fling page. Find it through the Search window. We are planning on it. We have been to several major and not so major cities in Canada – Montreal, Vancouver, etc. – but never Toronto. Looking forward to a fling in a setting similar to our own.